David has been referred by some as the “Father of the Black Hawk Helicopter” a title that notes but one of his many accomplishments during his 40 year career with Sikorsky Aircraft. Graduating from Worcester Polytechnic Institute in 1953, David joined the newly formed helicopter research group with United Aircraft Research Laboratories (later to become United Technologies Corporation) in East Hartford, Connecticut. In 1962 he transferred to the Sikorsky Division as Supervisor of Aerodynamics, leading a team of engineers in helicopter design. David notes that his early years were “a great time for an engineer to enter the helicopter field.” It was also a time David extended himself by working nights and weekends to earn his Masters Degree and his PhD in mechanical engineering. Over the next 30 years David developed innovative concepts for rotary-wing aircraft including new airfoils, blade shapes and vibration absorbers. He led design teams in developing early vertical takeoff and landing aircraft and the Rotor Systems Research Aircraft for NASA which David described as a “complex flying rotor laboratory.” The design concept he is most noted for is the “canted tail rotor” developed to accommodate a third engine and longer rotor blades on the CH-53 helicopter and now a familiar sight on the world’s most advanced helicopters. An interesting note to David’s early engineering years was the fact his work generally preceded the use of CAD/CAM computers and computer models to test hypotheses. The first computer capable of testing designs, the IBM-701, arrived just months before David started working for United Aircraft Research Labs. The big computer almost filled a huge hanger with all its vacuum tubes and early electronics. David and his teams developed their designs intuitively and used slide rules in their calculations while they learned the capabilities of the “new” computer. In 1970 the U.S. Army called for a new, small transport helicopter and David’s design team was ready to answer the challenge with the birth of the Black Hawk helicopter incorporating many of David’s innovations. True to his form as a gentleman, David will credit his design teams for the development his many innovations although everyone else credits David. Since 1973 the Black Hawk has been a most dependable workhorse for the Army and in its various configurations (USAF Pave Hawk, USN Sea Hawk, and USCG Jay Hawk) is utilized for, air cavalry assault, electronic warfare, search and rescue, medical evacuations, disaster relief and even executive transportation. Even before his retirement in 1993, David was an avid runner and is quite proud of the fact that he has competed in the Mattapoisett Road Race since its inception in 1971. In addition, David has completed 19 marathons including 6 Boston Marathons and 2 abroad. He is an avid sailor and is active in the Mattapoisett Yacht Club where he served as Commodore for 4 years. David and his lovely wife, Janet, continue a busy pace by keeping up with their three children and four grandchildren. Robert, better known as Rob in his high school years, was a three-sport athlete excelling in football, ice hockey and track & field. In addition, he maintained National Honor Society status and exemplified the term “student-athlete” at Fairhaven High School. In football Rob was a two-way player, tight end on offense and tackle on the defensive side of the ball. He was a “go to” receiver for Hall of Fame quarterback Jeff Perry and kept many a drive alive though out the season. A most notable reception came when Rob pulled in a 13 yard pass keeping the winning drive alive to defeat New Bedford, 14-12. In his senior year Rob received his varsity letter and the prestigious Antone C. Martin, Jr. Football Award. Rob lettered in Spring Track & Field in his senior year and excelled at hurling the javelin where he was consistently over 170 feet and was a member of the javelin relay team with Vic Fernandes and Scott Miller who combined for a FHS School Record 451 feet. Perhaps Rob’s greatest achievements were accomplished in the ice rink where he played an integral part in turning around a program that had suffered through two of the worst seasons in the FHS hockey history in 1979 and 1980. Rob made such a commitment to improve his team that he was awarded the captaincy in his junior year. Rob became an outstanding team leader demonstrating the maturity, work ethic and dedication that returned Fairhaven High School Hockey to the exemplary program it had been in the past. Rob’s exciting goal with 14 seconds remaining to defeat Dartmouth led the way to a Southeastern Massachusetts Conference Division III Championship and a trip to the State Tournament. Rob earned a varsity letter each year, was selected to the S.M.C. Division III All Star Team in each year and was selected to the Standard Times All Star Team in his senior year. Rob graduated with distinction from Southeaster Massachusetts University in 1985 where he earned a Bachelor of Science in Nursing. He completed his work at Pawtucket Memorial Hospital School of Nurse Anesthesia in 1991 and received his Masters Degree in Health Services in 1995 at Lesley College. Rob served in the United States Air Force and in the United States Army Reserve until his honorable discharge in 1996 with the rank of Captain. He is now President and owner of Anesthesia PROfessionals, Inc. in West Warwick, RI and recently the newly opened site in Las Vegas, Nevada. Rob and his lovely wife Kara (Gagnon) have raised five terrific children and reside in Mattapoisett, MA. 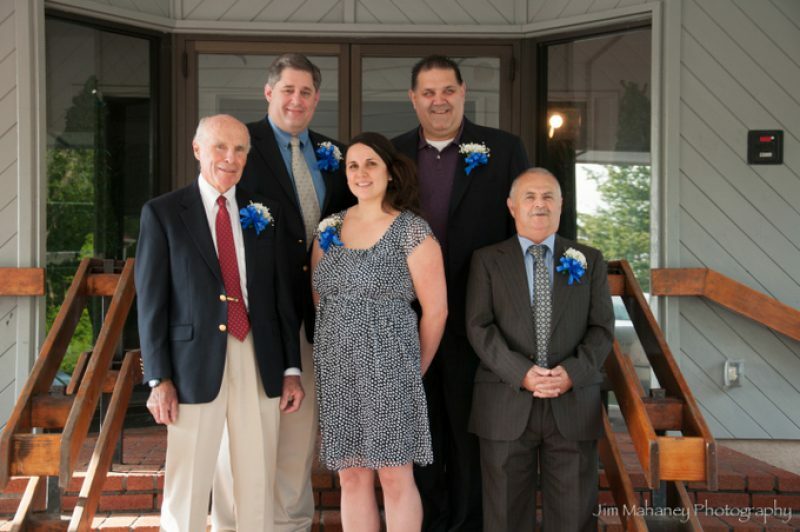 Kimberly is certainly among the greatest female athletes in the history of Fairhaven High School sports. She earned eleven varsity letters and was honored with nine South Coast Conference All-Star team selections in volleyball, indoor track and spring track & field. Kimberly played four years of volleyball earning three varsity letters and serving as captain in her senior year. She was selected to the South Coast Conference All-Star Team in each year from 1995-1996 as well as being selected to the Standard-Times All Star Teams in 1995 and 1996. She excelled at the middle hitter position where she was the premier blocker and averaged five kills per game. As successful as Kimberly was in volleyball, it was Indoor Track and Spring Track & Field where she excelled while competing in the 50, 100 and 200 sprints, the 300 and 400 middle distances, and the high jump and triple jump field events. In her four years with the Indoor Track program, Kimberly earned four varsity letters and was selected team captain in her senior year. She was undefeated in the South Coast Conference in the 300 meter run for three years with Greater New Bedford area best time of 38.6 seconds in the 300 yard sprint. She tied the school record in the indoor high jump at 5 feet 2 inches and the set a school record in the 300 yard sprint at 38.6. She was selected to the South Coast Conference All-Star Team and the Standard-Times All-Star Team in each year from 1995-1997. Kimberly continued her remarkable performances in the spring Track & Field seasons where she was undefeated in the South Coast Conference in the 400 meter run for three consecutive seasons from 1995 – 1997. She set a South Coast Conference Championship Meet record in the 400 meter with a time of 59.2 seconds. In 1997 she posted a 59.5 to take first place in the 400 meter at the State Class D meet. She was also a member of Fairhaven’s first place high jump team and a member of the fourth place 4 X 100 relay team at the State relays that year. Kimberly’s 59.2 time broke the school record in the 400 meter and she made an impressive personal best high jump with a leap of 5 feet 3 inches. She is the recipient of the FHS Athlete for ALL Seasons Award in each of her four years and in 1997 she was honored with the FHS Outstanding Female Athlete Award and the Mel Entin Award. She was honored by the South Coast Conference as the recipient of the Outstanding Overall Female Performer in Indoor and Spring Track in 1996 & 1997 as well as the 1997 SCC Championship Female Athlete of the Meet. In 1997 Kimberly was presented the Standard Times Leadership Award and the Standard Times Most Dedicated Athlete Award. Kimberly was a member a Senior Editor of the Yearbook, a member of the ski club and Spanish club while maintaining her National Honor Society status graduating 13th in her class. She went on to earn a B.S. in Biology at Northeastern University and a Masters Degree in Nutritional Education also at Northeastern. She is currently a Clinical Research Coordinator – Cardiovascular Division at Beth Israel Deaconess Medical Center in Boston, MA. Kimberly now lives in Boston with her husband Jonathan and their two children, Jacob (22 months) and Seraphina (5 months). Manny was a four sport athlete at Fairhaven High playing at the varsity level for three years in football, basketball and track as well as four years at the varsity level in baseball. Manny earned a football varsity letter in each of his three years while toiling in the trenches as a lineman where he played center, tackle and end for Coach Mel Entin. In his senior year he was honored with the Captain’s C along with fellow standout John Pina. In basketball the 6 foot 3 inch center averaged 12 points per game and was consistently a top rebounder game after game. In a most memorable game in his senior year against Barnstable, Manny was matched against the opponent’s star player in a classic battle during which he scored 24 points and gathered in so many vital rebounds causing the news reporter to dub him the “tower of strength.” The 1956 F.H.S. basketball team went on to win the Class B Bay State Tournament Championship and Manny was selected to the All-Tourney Team. Manny earned a varsity letter in each of his four years playing baseball under the direction of Hall of Fame Coach Alec Clement. A first baseman, Manny was known as a “heavy sticker” at bat and often had multiple hits during games including a two run single in the 6-4 win against rival New Bedford in his senior year. Manny also spent some time with the spring track team throwing the shot put and earning a varsity letter in his junior and senior year. This was most remarkable accomplishment as baseball and track were played in the same season and on occasion at the same time. Manny would get his shot put throws in and then hustle over to the baseball diamond for practice or a game. Manny continued to participate in sports after high school. He was a standout in CYO basketball and was a member of the Fleet Basketball Team while serving in the U.S. Navy. He became a noted figure on the softball diamonds throughout greater Fairhaven and was arguably one of the finest Fast-Pitch pitchers in the area. Standard Times sports reporter Buddy Thomas in his article on Sam’s retirement from FHS soccer back in 2005 referred to him as “the Father of Fairhaven soccer.” That title could not be more accurate as Sam Galvam arrived at Fairhaven High School in 1986 answering the call when a group of young men at FHS petitioned the school administration to add soccer to the athletic program. Hall of Fame Honored Member Roy DaSilva was the sole experienced soccer player on a team of athletes who, under Coach Galvam’s leadership, amassed an 8-2-2 record at the varsity level and a share of the South Coast Conference Championship with Greater New Bedford Voc-Tech in that inaugural season. The very next year Galvam’s team won the SCC Championship outright. Coach Galvam truly built this program from the original nine players who showed up that first practice, he recruited, coached, taught, inspired and motivated his players to three more South Coast Conference Championships (1989, 1990, & 1991) and never finished lower than second place in the conference during his eight years at the helm of the boys program. In 1994, Coach Galvam saw another challenge on the horizon as the Fairhaven Girls Club Soccer program planned to move to the varsity level. Sam once again answered the call and coached the girl’s program for the next 12 years. Although the girls’ teams never won a South Coast Conference Championship, Galvam’s girl’s teams finished in second place in their first two years and never finished below fourth place in the league. The girl’s soccer team faired well in tournament play as they qualified for the tournament each year and reached the South Sectional Semi-Finals twice in Galvam’s career. Coach Galvam’s soccer teams, both boys and girls, qualified for the Massachusetts Interscholastic Athletic Association’s State Soccer Tournament in each of his 19 years at the helm. This is an astonishing achievement for any coach in any sport. Soccer was not the only sport Sam coached at Fairhaven High School over the years. He also served as an assistant baseball coach in charge of the junior varsity program for three years and as a volunteer assistant coach for the girl’s varsity softball team for five years. Sam is proud to tell you that he and his wife Deborah have been married for over 40 years and have two grown children, Derek and Raygan. He may be even more proud to tell you that he is a grandfather of two girls, eight year old Mya and six year old Ari. Yes, they both play soccer. No, Sam does not coach. He and Deborah smile, laugh and thoroughly enjoy watching the girls play. Paul played four sports during his three years at Fairhaven High School and captained the 1925 football team that won seven consecutive games, five by shutout, before losing to Salem, 20-0 in the final game of the season. He also played guard on the 1925-1926 basketball team that amassed “the best record in several years” and also was a member of the school’s baseball and track teams. Paul entered Fairhaven in his sophomore year after spending his freshman year at New Bedford High School. He was a substitute lineman in his first season with the Fairhaven football team and didn’t get enough playing time to earn a varsity letter. Prior to his junior season, however, Paul added several pounds of muscle to his frame and combined that with the previous year’s experience to become a highly reliable lineman who played both the guard and tackle positions, eventually earning recognition as an All Bristol County League selection by the Fairhaven Star and Second Team All Bristol County League selection by The Standard Times. The following football season, Paul captained the 1925 team to a record of 7-1 and he was named an All Bristol County League First Team selection as an offensive tackle by The Standard-Times. Paul’s greatest individual contributions came in the sport of track where, in June 1925 he set a record at the fourth annual Bristol County League Invitational Track and Field Championships by throwing the shot put 39 feet 4 inches. He later shattered the state school boy mark during the meet at Harvard Stadium with a heave of 43-10. It was officially the Class B state record since that was the class in which Fairhaven competed, but the distance was eight inches better than the mark that broke the Class A record during that same meet. In every meet during the spring of 1926, Paul consistently threw the shot beyond the 40-foot mark. Against LaSalle, Paul won the shot put competition with a throw of 44 feet 7 inches. Paul went on to enroll at Rhode Island State College (now the University of Rhode Island) where he starred as a member and captain of both the football and track teams. Oddly enough, he was a quarterback in college, leading the 1930 team to a record of 5-2-1 and, in track, set several school records in both the shot put and discus events. Paul eventually received his Masters degree from Columbia and coached at the high school level in Stonington and Westport Connecticut before returning to the University of Rhode Island in 1936 where he served as a professor of physical education for men, assistant athletic director and coach of the baseball, basketball, football and golf teams, the last for more than 20 years, and for which he compiled the finest record in history to that time. At the time of his induction to the University of Rhode Island Hall of Fame in 1974 he had the most years of service (more than 38) with the University of Rhode Island Kingston Faculty.